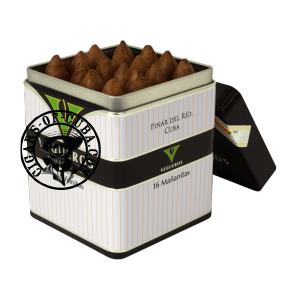 A dark chocolate oily wrapper perfectly encases a complex Cuban blend. 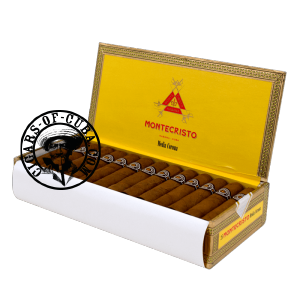 This powerful Belicosos gives off earthy and exotic dried fruit flavors. 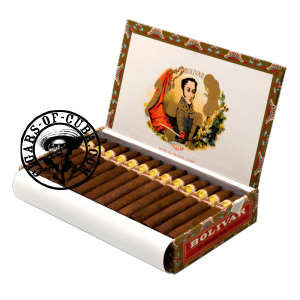 Produced in large quantities, this is a very consistent Cuban cigar, rarely suffering from draw problems. This cigar is enormously appreciated by Torpedo Aficionados in the world. The rich blend and full body makes of this Cuban an excellent cigar to age. Spicy and earthy aura, with a special salty taste on the lips. Earthy and spicy notes are dominant without being overpowering. In the second third, the smoke becomes more rich and complex: earthy and spicy with a shadow of a black honey taste. The Bolivar Belicoso has an exquisite final. The full earthiness is combined with Cuban cedar notes and a powerful dark pepper taste. The final may be slightly overwhelming for a beginner. A very mellow Corona perfectly suited to the beginner. Light aromas of wood and leather combined with a soft tobacco flavor give a gentle smoke that never aggresses, even in the finish. Lovely to smoke outdoors, the Cosacos is a true companion cigar, always there but never in the way. 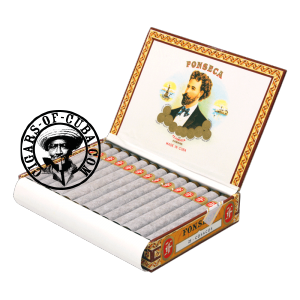 This is the top selling Fonseca and one of the lightest Corona cigars. All light wood and leather in this single phase cigar. It is recommended to smoke it in regular and slow puffs to avoid over heating. This cigar improves with age. 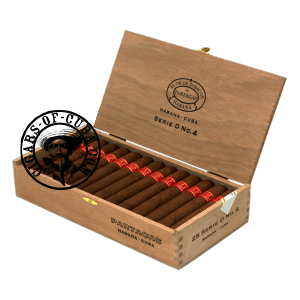 This big cigar has become very popular since its release in 2008. 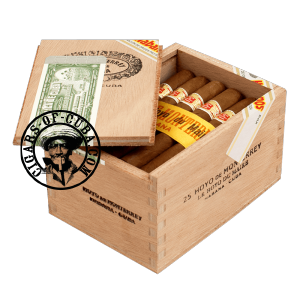 The flavors are very familiar H.Upmann, but the extra diameter gives this cigar another dimension. More ligero leaf gives more power and the blending of this, with the grassy/nutty flavors makes for a wonderful cigar. Huge aging potential, as this cigar will only get better with time in the humidor. Look for the blend to improve with time. 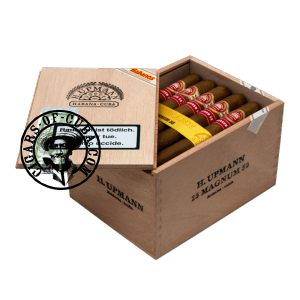 The H.Upmann Magnum 50 achieved great success in 2005 as part of the Habanos Limited Edition Series. This Habano will become the benchmark size of the brand, thanks to its elegant proportions (50 x 161) and its extraordinary blend, giving it a unique aroma and flavor. More ligero leaf gives more power and the blending of this, with the grassy/nutty flavors makes for a wonderful cigar. Simply a great cigar with a great start, a great middle and a superb finish! 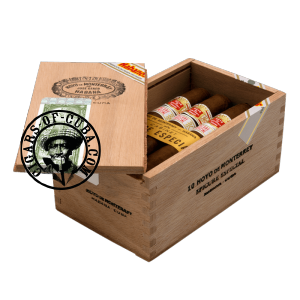 The Du Maire is the smallest of the Le Hoyo Series and similar in flavor to the rest of the line. This fun, any-time-of-day smoke, has excellent combustion and a great draw. It is a 30 minute smoke, but does manage to deliver classic tangy, sweet woody aromas in a medium strength smoke. An excellent starter Cuban cigar, which will allow novices to test their palates in a safe environment. It's discreet and ideal for a coffee break: mild and slightly acid. It is a 30 minute smoke, but does manage to deliver classic tangy, sweet woody aromas in a medium strength smoke. One of the first double banded Hoyo's (at the time of writing this), the Epicure Especial adds to the already legendary Epicure linea. Typically Hoyo'esque in flavor and power. Never too much, but always enough! It will end and you will want more, but give your palate time to appreciate the experience. It's not a Churchill, it's not a Hermoso No.4 and it's not a Corona. This Corona Gorda can be enjoyed young, when it is easy and fresh or aged, when the youthful character subdues to reveal a very subtle grassy smoke, perfect for the aficionado's aperitif smoke. Sweet wood, vanilla, caramel and black pepper mingles in a generous and creamy smoke. The beautiful colorado-maduro wrapper cape's a fine construction, producing a draw and burn as good as any cigar rolled in Cuba. The smell of Cuban cedar is dominant and whilst not obscuring all others, we detect some wonderful hints of cinnamon. Heady smoke. Regular draw. Even if the Cuban cedar notes are dominant, you can discover many associated aromas and flavors. In the second third, the woody notes become more present and the smoke evolves progressively in a dry way. The great surprise is rare hints of cinnamon in this dry woody finale, which is just hot without being harsh. 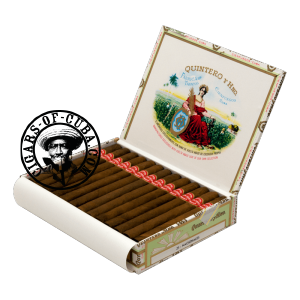 This is perhaps the mildest of all the Quintero cigars. The burn is smooth, revealing mellow earthy, grassy and tobacco aromas. The more experienced smoker will pick up a delicate herbaceous sweetness in the initial phases. Very reasonable price for a trusted Cuban.